The police on Wednesday finally booked assailants involved in the brutal assault on four Darjeeling youth in Gurgaon for attempt to murder under Section 307 of the Indian Penal Code. A case under milder sections 147, 148, 149, 323, 506, and 452 of IPC was registered on Monday evening at the DLF City phase 2 police station. The four youth were “brutally assaulted” on Saturday at their rented accommodation by a group of men in Nathupur village near DLF Phase 3 in Gurgaon. On Wednesday, the Gurgaon police invoked Section 307 against the accused after getting a medical report from AIIMS Trauma Centre where one of the victims has been admitted with multiple injuries. “We have charged the culprits under Section 307 after getting the hospital’s report ,” said DCP east Deepak Saharan. He also assured the members of the Gorkha community who had gathered in large numbers at his office that police will take action. 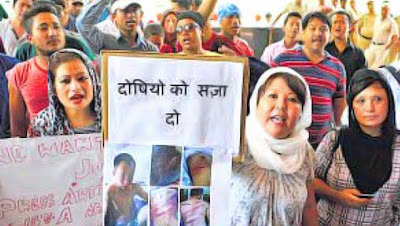 Earlier, the members of the Gorkha community carried out a protest march from Sahara Mall to the office of DCP east near Galleria Market. The protesters carried placards protesting against police inaction, and shouted slogans against delay in filing of FIR against the accused. Saneela Gurung, who lives in the same house where the fight took place, said that they heard commotion on Saturday night, and saw a group of men attack the Gorkha youth. “There was no light at that time . When we came down the youth were badly injured,” she said. The protesters who came from across NCR alleged that lack of action by police is responsible for increasing number of hate crimes against the community in Gurgaon, and other cities. Even though Gurgaon police has assured strict action against accused, protestors across NCR said cops’ apathy responsible for hate crimes. Gurgaon police commissioner Navdeep Singh Virk, however, had on Tuesday denied the charges saying that the matter was brought to the notice of the police on Monday evening only after which the area SHO was rushed to AIIMS and a case was registered. Members of the community have urged the police to press charges of racial abuse against the accused.